Desiderio Alberto Arnaz y de Acha III (March 2, 1917 – December 2, 1986), better known as Desi Arnaz, was a Cuban-born American actor, musician, and television producer. He is best remembered for his role as Ricky Ricardo on the American television series sitcom I Love Lucy. He co-starred on that show with dramatic and comedic actress Lucille Ball (1911–1989), to whom he was married at the time. He and Ball are generally cred as the innovators of the syndicated rerun, which they pioneered with the I Love Lucy series. Pérez Firmat, Gustavo. "The Man Who Loved Lucy," in Life on the Hyphen: The Cuban-American Way. Austin: The University of Texas Press, 1994. Rpt. 1996, 1999. Revised and expanded ion, 2012. ^ "Richard Denning". Variety. 21 October 1998. Retrieved 2 March 2019. ^ Karol, Michael (2008). Lucy A to Z: The Lucille Ball Encyclopedia. iUniverse. p. 60. Retrieved 23 December 2016. ^ Karol, Michael (2008). Lucy A to Z: The Lucille Ball Encyclopedia. iUniverse. p. 16. Retrieved 23 December 2016. ^ a b Monush, Barry (2011-06-01). Lucille Ball FAQ: Everything Left to Know About America's Favorite Redhead. Rowman & Littlefield. ISBN 9781557839404. ^ "Saturday Night Live | TV Guide". TVGuide.com. Retrieved 2019-03-02. ^ "The Paley Center for Media". The Paley Center for Media. Retrieved 2019-03-02. ^ jtranscripts, Author (2018-10-08). "SNL Transcripts: Desi Arnaz: 02/21/76". SNL Transcripts Tonight. Retrieved 2019-03-02. 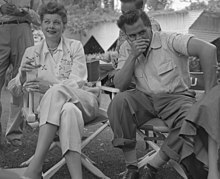 ^ "Desi Arnaz Papers, 1947-1976 | Special Collections & University Archives". scua2.sdsu.edu. Retrieved 2019-03-02. ^ "Desi Arnaz: Hall of Fame Tribute". Television Academy. Retrieved 2019-03-02. ^ "The Mambo Kings (1992)". AFI | Catalog. American Film Institute. Retrieved 8 March 2019. ^ "Desi Arnaz's 102nd Birthday". Google. Retrieved 2019-03-02.